Objective Diverticulitis is a common disease with a substantial clinical and economic burden. Besides dietary fibre, the role of other foods in the prevention of diverticulitis is underexplored. 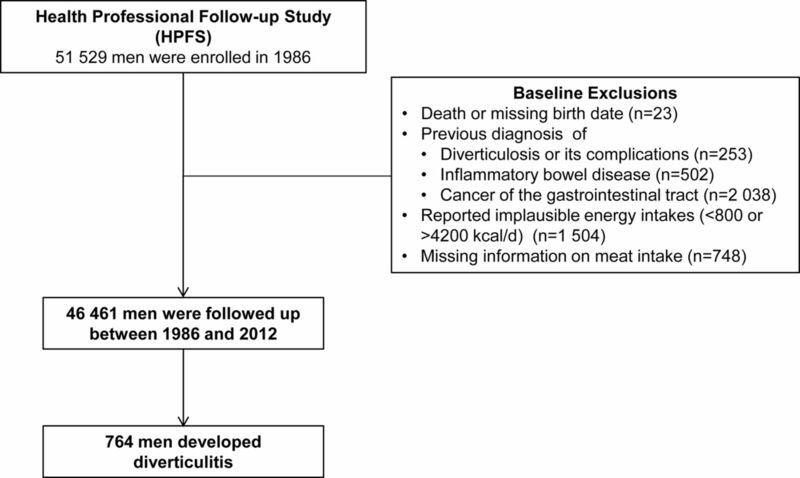 Design We prospectively examined the association between consumption of meat (total red meat, red unprocessed meat, red processed meat, poultry and fish) with risk of incident diverticulitis among 46 461 men enrolled in the Health Professionals Follow-Up Study (1986–2012). Cox proportional hazards models were used to compute relative risks (RRs) and 95% CIs. Results During 651 970 person-years of follow-up, we documented 764 cases of incident diverticulitis. Compared with men in the lowest quintile (Q1) of total red meat consumption, men in the highest quintile (Q5) had a multivariable RR of 1.58 (95% CI 1.19 to 2.11; p for trend=0.01). The increase in risk was non-linear, plateauing after six servings per week (p for non-linearity=0.002). The association was stronger for unprocessed red meat (RR for Q5 vs Q1: 1.51; 95% CI 1.12 to 2.03; p for trend=0.03) than for processed red meat (RR for Q5 vs Q1: 1.03; 95% CI 0.78 to 1.35; p for trend=0.26). Higher consumption of poultry or fish was not associated with risk of diverticulitis. However, the substitution of poultry or fish for one serving of unprocessed red meat per day was associated with a decrease in risk of diverticulitis (multivariable RR 0.80; 95% CI 0.63 to 0.99). Conclusions Red meat intake, particularly unprocessed red meat, was associated with an increased risk of diverticulitis. The findings provide practical dietary guidance for patients at risk of diverticulitis. Diverticulitis is a common disease that results in enormous clinical and economic burden. Little is known about its epidemiology and etiopathogenesis. Besides dietary fibre, the role of other dietary factors in the prevention of diverticulitis is underexplored. Red meat intake, particularly unprocessed red meat intake, was associated with an increased risk of diverticulitis. Substitution of unprocessed red meat per day with poultry or fish may reduce the risk of diverticulitis. The findings may provide practical dietary guidance for patients at risk of diverticulitis. Diverticulitis is the inflammation of diverticula of the colon. It is a common disease that results in about 210 000 hospitalisations per year in the USA at a cost of more than US$2 billion.1 Recently, the incidence of diverticulitis has been rising, particularly in young individuals.2 ,3 Approximately 4% of patients with diverticula develop acute or chronic complications including perforation, abscess and fistula.4 Despite the enormous clinical and economic burden of diverticulitis, little is known about its epidemiology and etiopathogenesis.5 Although smoking,6 ,7 non-steroidal anti-inflammatory drugs (NSAIDs),8 physical inactivity and obesity9–11 are identified as risk factors for diverticulitis, dietary factors are less explored. Dietary fibre is the most studied dietary risk factor for diverticular disease. However, a few studies suggest that red meat consumption may also be important.12 ,13 A recent prospective UK population-based cohort study found that risk of diverticular disease was 31% lower among vegetarians or vegans (relative risk (RR): 0.69; 95% CI 0.55 to 0.86) compared with meat eaters.13 However, the endpoint of the study was diverticular disease that required hospitalisation, and therefore the results may not be generalisable to patients with more common and mild presentations of diverticulitis.1 In addition, the specific contribution of red meat, poultry or fish to the observed link was not investigated. In our prior analysis from a large prospective cohort study, the Health Professionals Follow-Up Study (HPFS), we found that red meat intake, independent of fibre, may be associated with a composite outcome of symptomatic diverticular disease, which included 385 incident cases over 4 years of follow-up.12 Diverticulitis is distinct in presentation, treatment and pathophysiology from other manifestations of diverticular disease including uncomplicated diverticulosis and diverticular bleeding.5 Thus, in the present study, we updated this analysis, which allowed us to prospectively examine the association between consumption of meat (total red meat, red unprocessed meat, red processed meat, poultry and fish) with risk of incident diverticulitis in 764 cases over 26 years of follow-up. The HPFS is a large ongoing prospective cohort study of 51 529 US male health professionals aged 40–75 years at enrolment in 1986. Participants have been mailed questionnaires every 2 years since baseline to collect data on demographics, lifestyle factors, medical history and disease outcomes and every 4 years to update dietary intake. The overall follow-up rate is greater than 94%.14 This study was approved by the institutional review board at the Harvard T.H. Chan School of Public Health. Men who reported a diagnosis of diverticulosis or its complications (n=253), IBD (n=502) or a cancer of the GI tract (n=2038) at baseline in 1986 were excluded from the analysis (figure 1). In addition, we excluded study participants who reported implausible energy intakes (<800 or >4200 kcal/day) (n=1504) and who did not answer questions regarding intake of unprocessed and processed meat, poultry and fish (n=748). A total of 46 461 men were included in the current analysis. In our primary analyses, we examined the association between consumption of meat (total red meat, red unprocessed meat, red processed meat, poultry and fish) with risk of incident diverticulitis. Person-years of follow-up accrued from the date of return of the 1986 questionnaire until either the date of diagnosis of diverticulitis, diverticulosis or diverticular bleeding, death or 31 December 2012, whichever came first. We censored men who reported a new diagnosis of GI cancer or IBD. Cox proportional hazards models with time-varying meat consumption and covariates were used to compute HRs as estimates for age-adjusted and multivariable-adjusted RRs and 95% CIs. To control as finely as possible for confounding by age, calendar time and a possible interaction between these two time scales, we stratified models jointly by age (in months) and 2-year questionnaire cycle. In age-adjusted models, we additionally adjusted for total energy intake. In multivariable models, we further adjusted for the following potential confounders: body mass index (BMI) (kg/m2 in quintiles), vigorous physical activity including activities with a metabolic equivalent task (MET) score of 6 or more (MET hours/week in quintiles), smoking history (never smokers, <4.9, 5–19.9, 20–39.9, ≥40 pack years), fibre intake (g/day in quintiles), regular use of aspirin, non-aspirin NSAIDs and acetaminophen (≥2 vs <2 times/week). We updated meat consumption as well as other covariates prior to each 2-year or 4-year interval (simple updating). Tests for linear trend were performed using meat consumption as a continuous variable. We examined the possible non-linear relation between meat consumption and risk of diverticulitis non-parametrically with restricted cubic splines.18–20 To test for non-linearity, we used a likelihood ratio test, comparing the model with only the linear term to the model with the linear and the cubic spline terms. Departures from the proportional hazards assumption were tested by likelihood ratio tests comparing models with and without the interaction terms of age or calendar time by categories of meat consumption. No significant violation of the proportionality assumption was found (p>0.05 for all tests). As an exploratory analysis, we assessed the association between components of red meat including total fat, saturated fat, cholesterol and haem iron and incident diverticulitis, with and without additionally adjusting for unprocessed and processed red meat. To facilitate the translation to dietary recommendations regarding meat intake, we estimated the associations of substituting one serving of poultry or fish for one serving of red meat with incident diverticulitis by including both as continuous variables in the same multivariate model. The difference in their β coefficients, as well as their variances and covariance, was used to estimate the RR and 95% CI for the substitution associations.21 ,22 All of the analyses were performed using SAS V.9.4 (SAS Institute, Cary, North Carolina, USA), and the statistical tests were two-sided and p values less than 0.05 were considered statistically significant. During 651 970 person-years of follow-up, we documented 764 incident cases of diverticulitis. Compared with men with lower intake of red meat, men with higher red meat consumption smoked more, used non-aspirin NSAIDs and acetaminophen more often, and were less likely to exercise vigorously (table 1). As expected, their intake of total fat, saturated fat, cholesterol and haem iron were substantially higher. In contrast, fibre intake among these men was lower. Compared with men with lower poultry or /fish consumption, men with higher poultry or /fish consumption were more likely to be engaged in vigorous physical activity, use aspirin, smoke less, and had higher intake of haem iron. Men with higher poultry intake also had higher intake of cholesterol, and individuals with higher fish intake had lower intake of total and saturated fat. Overall, total red meat intake was associated with an increased risk of diverticulitis. Compared with men in the lowest quintile (Q1) of total red meat consumption, men in the highest quintile (Q5) had a multivariable RR of 1.58 (95% CI 1.19 to 2.11) (table 2) after adjustment for total fibre and all other potential confounding variables. The risk of incident diverticulitis increased 18% per serving of red meat consumed per day (p for trend=0.01). 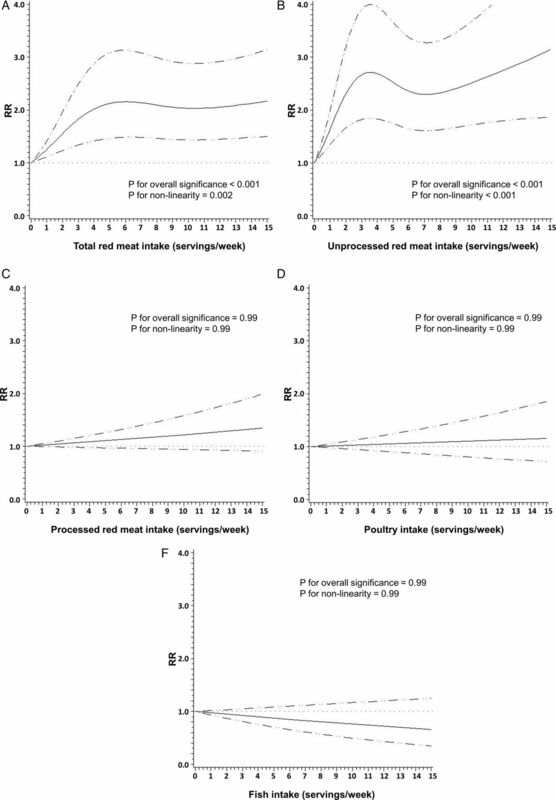 Nonparametric regression curves suggest that the dose–response relationship for total red meat was non-linear (p for non-linearity=0.002): even one serving per week appeared to increase risk, with risk plateauing after six servings per week (figure 2). Non-parametric restricted cubic splines of meat intake (servings/week) and risk of diverticulitis. (A) Total red meat. (B) Unprocessed red meat. (C) Processed red meat. (D) Poultry. (E) Fish. The observed link between total red meat intake and risk of diverticulitis appeared primarily driven by consumption of unprocessed red meat. Men in the Q5 of unprocessed meat consumption had an RR of 1.51 (95% CI 1.12 to 2.03; p for trend=0.03) compared with men in the Q1, even after adjusting for processed red meat intake. In contrast, processed red meat was associated with increased risk of diverticulitis only in the age-adjusted model, but not after further controlling for other covariates, without or with adjustment for unprocessed red meat (RR for the Q5 vs Q1: 1.03; 95% CI 0.78 to 1.35; p for trend=0.26). Additional adjustment for red meat components including total fat, saturated fat, cholesterol and haem iron minimally changed the associations observed above (data not shown). The findings were similar among overweight and obese men, and men who were younger than 60 years or aged 60 years and above. An exploratory analysis of major red meat components indicated a modest association between total fat intake and diverticulitis (RR for the Q5 vs Q1: 1.33; 95% CI 1.00 to 1.77) after adjusting for unprocessed and processed red meat intake (see online supplementary table S1). Poultry was not associated with risk of incident diverticulitis (RR for the Q5 vs Q1: 1.09; 95% CI 0.86 to 1.39; p for trend=0.55) (table 2). Higher fish intake was associated with reduced risk of diverticulitis in age-adjusted model, but not after further adjustment for other potential confounders (RR for the Q5 vs Q1: 0.87; 95% CI 0.68 to 1.10; p for trend=0.20). The multivariable RR of diverticulitis associated with substitution of poultry or fish for one serving of unprocessed red meat per day was 0.80 (95% CI 0.63 to 0.99). In contrast, substituting one serving of red processed meat per day with poultry or fish was not significantly associated with risk of diverticulitis (RR 0.86; 95% CI 0.67 to 1.09). In this large prospective cohort of men, total red meat intake, especially consumption of unprocessed red meat, was non-linearly associated with an increased risk of diverticulitis. Moreover, we identified unprocessed red meat, but not processed red meat, as the major driver for the link between red meat and diverticulitis. The association was independent of fibre intake. As a component of red meat, total fat intake was associated with an increased risk of diverticulitis even after adjusting for unprocessed and processed red meat intake. In contrast, higher consumption of poultry or fish was not linked with risk of incident diverticulitis. However, substitution of one serving of unprocessed red meat per day with poultry or fish was associated with a 20% lower risk of diverticulitis. Our findings were generally in line with our prior early analysis that red meat, but not poultry or fish, is associated with an increased risk of diverticular disease. However, in this study we were able to examine diverticulitis separately from diverticular bleeding and symptomatic uncomplicated diverticular disease, rather than using a composite endpoint. In addition, in comparison with the prior study of red meat in the HPFS cohort,12 our cohort included 22 additional years of follow-up and more than twice as many cases. We also observed that unprocessed red meat, but not processed red meat, was the primary driver for the association between total red meat and risk of diverticulitis. Compared with processed meat, unprocessed meat (eg, steak) is usually consumed in larger portions, which could lead to a larger undigested piece in the large bowel and induce different changes in colonic microbiota. In addition, higher cooking temperatures used in the preparation of unprocessed meat may influence bacterial composition or proinflammatory mediators in the colon. These hypotheses need to be confirmed by other studies. The strengths of our study include a large, well-characterised population with detailed, prospective and updated assessment of meat consumption over 26 years of follow-up. We were also able to differentiate diverticulitis from diverticular bleeding and uncomplicated diverticulosis. As these manifestations appear to arise via different biological mechanisms, they are likely to have distinct risk factors. In addition, the large number of cases of diverticulitis accrued during long-term follow-up in this study allowed us to examine subtype-specific meat consumption and its dose–response relationship with risk of incident diverticulitis. There are also limitations of this study. First, misclassification of self-reported outcome was likely. However, healthcare professionals are more likely to accurately self-report medical information, and reports of diverticulitis have been validated in this cohort.10 ,11 ,17 Second, measurement errors associated with recall of meat consumption as well as potential confounders were possible; however, they would be non-differential to diagnosis of diverticulitis. Third, even though we were able to adjust for a variety of potential confounders, the possibility of residual confounding can never be ruled out. In addition, due to limited number of people consuming a vegetarian diet, we were unable to estimate the substitution effect of a vegetarian dish. Finally, the generalisability of our data to other populations, particularly women and other racial or ethnic groups, may be limited. In summary, we found that intake of red meat, particularly unprocessed red meat, was associated with an increased risk of diverticulitis. Substitution of unprocessed red meat with poultry or fish may reduce the risk of diverticulitis. Our findings may provide practical dietary guidance for patients at risk of diverticulitis, a common disease of huge economic and clinical burden. The mechanisms underlying the observed associations require further investigation. We would like to thank the participants and staff of the Health Professionals Follow-Up Study for their valuable contributions.
. A prospective-study of diet and the risk of symptomatic diverticular-disease in men. Am J Clin Nutr 1994;60:757–64.
. Effectiveness of various mailing strategies among nonrespondents in a prospective cohort study. Am J Epidemiol 1990;131:1068–71.
. Reproducibility and validity of dietary patterns assessed with a food-frequency questionnaire. Am J Clin Nutr 1999;69:243–9.
. Splines as a Useful and Convenient Statistical Tool. Am Stat 1979;33:57–62.
. Potato and French fry consumption and risk of type 2 diabetes in women. Am J Clin Nutr 2006;83:284–90. Contributors YC and ATC had full access to all of the data in the study, and take responsibility for the integrity of the data and the accuracy of the data analysis. Study concept and design: YC, LLS, ELG and ATC. Acquisition of data: LLS, BRK, IT and ATC. Analysis and interpretation of data: all coauthors. Drafting of the manuscript and statistical analysis: YC. Critical revision of the manuscript for important intellectual content: all coauthors. Obtained funding: LLS, ELG and ATC. Administrative, technical or material support and study supervision: LLS and ATC. Funding This work was supported by grants R01 DK101495, R01 DK084157, K24 DK098311 and UM1 CA167552 from the National Institutes of Health. Competing interests ATC previously served as a consultant for Bayer Healthcare, Aralaz Pharmaceuticals and Pfizer Inc. for work unrelated to the topic of this manuscript. This study was not funded by Bayer Healthcare, Pozen Aralez Pharmaceuticals or Pfizer Inc.